KNBR sports radio hosts Mac (Paul McCaffrey, left, above) and Murph (Brian Murphy) wait tables while sports/traffic anchor Dan Dibley (left) delivers a pizza at Amici’s in downtown Menlo today. The occasion, a benefit for the Second Harvest Food Bank, saw the radio personalities chatting more with patrons than busing tables, but few seemed to mind. 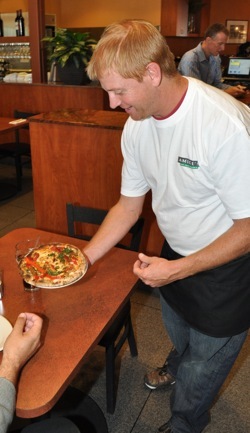 Amici’s donated all of their proceeds from 11 AM to 3 PM today to Second Harvest. Unknown if the regular shift shared their tip money with the KNBR crew, but Menlo Mayor Heyward Robinson was among the patrons. Update: Richard Allum, Amici’s Director of Marketing, reports that lunch receipts were $2300, to which Amici’s added a $1000 ‘tip’ for each of the three celebrity waiters, for a total of $5300 donated to Second Harvest.